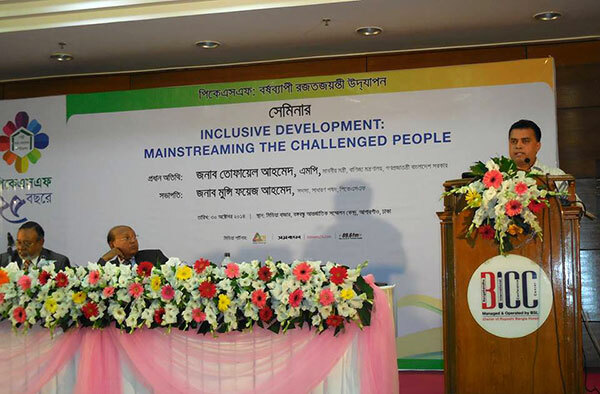 Commerce Minister Mr. Tofail Ahmed said the government has attached highest priority to mainstreaming the challenged people through making them efficient workforce for ensuring inclusive development in the country. “Like other people, physically challenged people are getting equal opportunities to flourish their talent to become worthy citizen of the country,” he told a seminar on “Inclusive development: mainstreaming the challenged people” at Bangabandhu International Conference Center. Chief Executive of YPSA Md. Arifur Rahman made a presentation at the seminar. Palli Karma-Sahayak Foundation (PKSF) organized the seminar as part of celebrating its 25th founding anniversary on 30 October 2014. Officials, rights activists, representatives of different non-government organizations, among others, took part in the open discussion with member of board of directors of PKSF Munshi Foiz Ahmed in the chair. Tofail said the government is implementing various projects for the welfare of the people with disability to make sure their survival in society with dignity. 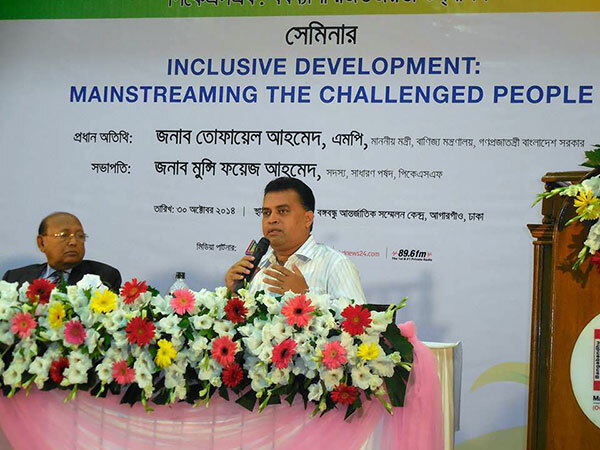 In his presentation, Arifur Rahman said nearly 10 percent of total populations in Bangladesh are having different kinds of disabilities. The World Health Survey estimates that 110 million with 2.2 percent have very significant difficulties in functioning while the Global Burden of Disease estimates that 190 million with 3.8 percent have severe disability, he added. Inclusive education, inclusive healthcare facilities and ensuring equal access in the social and financial resources are need for inclusive development, he added. Other speakers said persons with disabilities in the country are being neglected from all levels of society including family. They said all should treat them like normal people by ensuring all facilities to flourish their potential.